Fort Collins resident Daniel Palmer believes it’s a miracle that he lived to tell the story of his Aug. 30 hike to the summit of Capitol Peak and his descent after being stuck on its steep north face. The 45-year-old medical-equipment technician said he’s not a religious person in the traditional sense. He’s been “mad at God” because of his isolation following a divorce seven years ago, which led to his estrangement from his children. But he’s certain that, along with Mountain Rescue Aspen, a higher power intervened that sleeting afternoon when he spent more than three hours wedged on a half-chimney next to a 1,000-foot vertical drop — unable to go any farther — waiting for a rescue team to arrive and bring him back to safe ground. 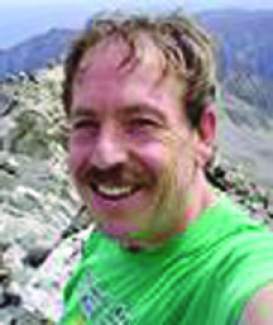 Palmer said he’s an experienced climber of Colorado fourteeners. He set out for the peak early that morning with someone he met through 14ers.com, an informational website on Colorado’s highest peaks, after camping the previous night near Capitol Lake. His companion was younger and reached the summit ahead of Palmer. By the time Palmer reached the 14,130-foot summit around 11 a.m., the other hiker was already on his way down, having chosen the traditional route, the narrow traverse known as the Knife Edge. Palmer witnessed some bad weather moving in and didn’t stay long at the top. Somehow, he said, he got “turned around,” and instead of taking the Knife Edge, he ended up descending along the steep north face of the mountain. The decision was odd, he said, because before making the trip west from Fort Collins he was cognizant of the fact that another hiker this summer — a man who shared his last name — died trying the north-face route. Ryan Joseph Palmer, 35, of Vail, is believed to have fallen 200 to 300 feet on the north face of Capitol Peak on July 19, according to the Pitkin County Sheriff’s Office. His body was recovered two days later. “It’s one of the things I can’t wrap my mind around: why or how I ended up on the north face. I wasn’t intimidated by the Knife Edge. I definitely had no qualms about going back that way. It’s just that I got turned around, and by the time I realized where I was, it was too late: I couldn’t climb back up,” Palmer said. Thoughts of “fate and mortality” ran through is mind at that point. “How did I find myself doing exactly what this other guy did when I knew very well not to do it?” he said. Palmer said he was able to get three-fourths of the way down the north face when he reached a point where he knew he couldn’t go any farther. He was on a narrow half-chimney with a vertical drop of more than 1,000 feet on the other side of it. Soon he was frozen — not by temperatures but by fear. “I was wedged in what was kind of a half-chimney, with my back against one cliff face and my feet against another. I was just sort of hanging there for three hours. Lots of thoughts were going through my mind, like how did I get here, and death, and how are they going to get to me, and how long can my strength hold out,” Palmer said. He said he started shivering uncontrollably, but not from temperatures. He could hear rocks falling and sliding in the valley below. A Black Hawk helicopter arrived, circling many times, seeming to acknowledge his presence. He saw a nearby ledge that would make it easier for rescuers to get to him, but it was just out of arm’s reach. On what he describes as a leap of faith, he stretched and made it to the ledge, which was next to the steep, 1,000-foot drop. “That was the scariest time I had up there, reaching for that ledge,” he said. And then, after decent weather throughout his lonely ordeal, it started to sleet. At that precise moment, he looked up and saw the face of one of the two Mountain Rescue Aspen team members who had been dropped off above him. The situation was not yet over, and some difficulty ensued. The rescuer put Palmer in a harness, and they rapelled several hundred feet along the north face. Somehow during the event, a rock was dislodged above him and hit him below the kneecap, stinging him like a bullet. After reaching an ice-packed area, he was told to slide along it, which shredded his jeans. Finally they reached the area where the helicopter was able to pick him up. They flew to the Aspen-Pitkin County Airport, where an ambulance took him to Aspen Valley Hospital. He was treated for minor scrapes and abrasions and rested there for five or six hours. Palmer gives thanks not only to Mountain Rescue Aspen but to Pitkin County Sheriff’s Deputy Adam Crider, who assisted him the next day in getting him back to the Ditch Trail, where his vehicle was parked. Crider also helped him with a flat tire on his vehicle. He had to hike more than six miles to the spot where he had camped before embarking on the frightening journey to retrieve his gear. There, he met other campers who were talking about him as he arrived, and they offered him some aid and kind words, as well. Though the experience was not something he would want to replicate, he said it wouldn’t deter him from one of his favorite pastimes.